Tony Rebel establishes once again that he is a champion torch bearer for reggae music with his newest release Realms of Rebel. This crucial RAS Records album contains 16 tracks which personify the essence of reggae music and rastafari. Rebel calls for a spiritual awakening on songs like One Love, Brothers, Who Is and Praises In The Morning, and pleads for moral upliftment and for people to stand strong on Loyal Soul Jah, Rasta Right Again and Judgment. Though Realms of Rebel is Lalibela's first album in several years, many 7" singles were released during that time, both on Penthouse and his own Flames Records label. Several of these are featured on Realms of Rebel, including A So We Like It, Hypocrites, Queen Divine (Mama), and Si Jah Esta A Lado De Me, the Spanish version of his big hit "Jah By My Side" sung over a reggae-mambo-latin rhythm. Be on the lookout for the video of this song which was just filmed in Puerto Rico. 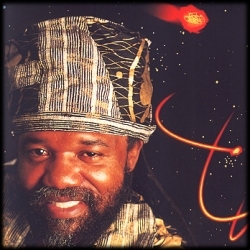 Tony Rebel demonstrates his versatility in riding any rhythm, whether singing over nyahbinghi, reggae, dancehall or mambo. He has a remarkable ability to merge his roots rastafarian beliefs with dancehall beats, and projects his convictions and ideologies in an aura that is authentic and inspiring. "Know your responsibility as well as your potential and ability" proclaims Rebel. Dancehall music has often been criticized for its slackness, disrespect for women and glorification of guns and violence. RAS Records has recently embarked on a "Clean up the dancehall" campaign. A (bobo) broom is even included in their promotional materials! With its conscious lyrics and positive message, Realms of Rebel is a magnificent contribution to this musical crusade. 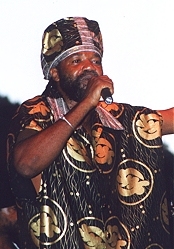 In addition to a prolific musical career, Tony Rebel has also guided many other artists on their musical paths, like Garnett Silk, Everton Blender, and Jah Mason. Since 1993, Flames Productions has held Rebel Salute, the annual celebration of Rebel's earth day that has become the hallmark of roots concerts Jamaica. The world needs more torch bearers like Tony Rebel.